Transformers are “in” this summer. No, I know the movie got panned. I’m thinking about real transformers, like this monarch butterfly. 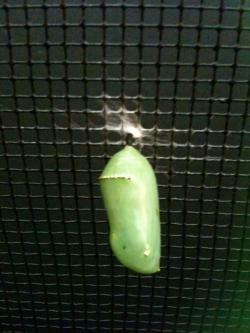 I know she doesn’t look like a butterfly, but there’s some serious shape-shifting going on inside that chrysalis. And I’m expecting to find a lovely, newly hatched butterfly in the tank any day now.